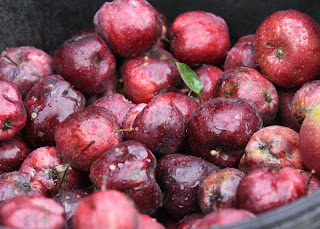 Here are some images from our recent Cider Day. 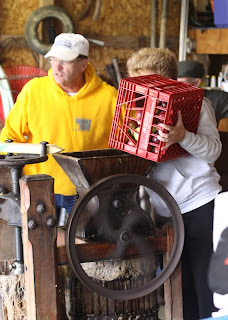 My father owns an antique cider press and has allowed friends and family to gather each fall to press apples and share in this tradition. The press is over 100 years old and is entirely hand-operated. 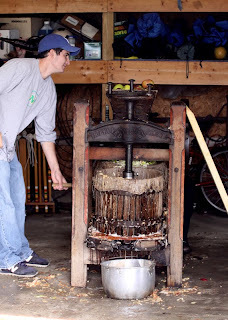 The apples are cleaned and rinsed and run through a crusher, which deposits the apple bits into a barrel. This barrel is moved to a press stage where the juice is pressed out and the remaining pomace is composted. 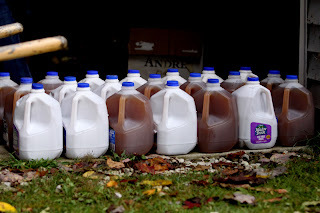 This year we produced well in excess of 60 gallons of cider. A good variety of apples and sometimes pears are used to create a good blend. Whether enjoyed fresh, canned or fermented into hard cider, the fall pressing is a great way to honor the autumn season! This entry was posted in Cider, Fall by admin. Bookmark the permalink.